New York City’s Department of Transportation (DOT) Commissioner Polly Trottenberg kicked off National Work Zone Awareness week today, being observed nationally from April 11 to 15, 2016. To support these safety efforts and public awareness education, Council Member Ydanis Rodriguez; Charles O’Shea from New York State DOT; Emmett McDevitt from the Federal Highway Administration, New York Division Office; Leonard Singh, vice president of Manhattan Electric Operations, Con Edison; Chris Levendos, President, Verizon New York; Renee V. McClure from National Grid; Mike DeMarco, president Local 1455; Marvin Robbins from Local 983; and Jonathan Vandenburgh from Local DC37; joined several members of DOT’s roadway team at the location of a concrete work for a Vision Zero street improvement project at 66th Street and 2nd Avenue in Manhattan. Commissioner Trottenberg also announced specific safety measures around work zones to protect crews maintaining infrastructure citywide. DOT has hired new staff that will be out in work zones constructing new sidewalks and paving City streets. 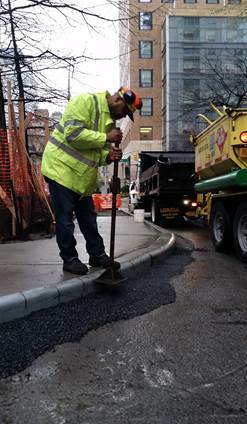 Most new DOT workers are in the Roadway Repair and Maintenance division, which is responsible for citywide road improvements and maintenance, including by repaving streets and filling potholes. “Last year, there were 723 crashes, resulting in six fatalities and 159 injuries in work zones on New York State roads and bridges. You can help the people fixing roads throughout New York City get home safely each day by being patient, slowing down and getting rid of all distractions when driving through work zones,” said New York State Department of Transportation Commissioner Matthew J. Driscoll. “The men and women who work on our highways and roads need to be as protected as possible from passing motorists while on the job. We have lost too many DOT workers to careless drivers over the years, and Work Zone Safety Awareness Week is a great reminder to travelers that they are sharing the road while passing through a work zone. We should thank our fellow New Yorkers working to improve and repair our infrastructure, and I applaud New York City DOT for reminding drivers to exercise caution when travelling through these areas,” said Assemblymember Michael Cusick. “Like everything else in New York City, our roads require us to share space in order to get where we're going. DOT's new safety measures in construction zones will make it easier for drivers, pedestrians and cyclists to share the roads with DOT staff who are hard at work upgrading our infrastructure,” said Assemblymember Dan Quart. 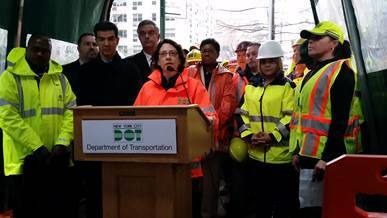 “I commend Commissioner Polly Trottenberg and DOT’s mission to include new initiatives to protect people on the roads, sidewalks as well as the construction crew members, as we continue promoting safety measures around work zones during the National Work Zone Awareness Week. The 2016 New York State budget includes a robust plan to repair New York’s aging roads and bridges, as well as a thorough investment in the MTA’s capital plan. Growing New York’s economy depends largely on the investments we make in public transportation and infrastructure. As we are making an investment in the future of transportation, we must make sure that we are diligent in putting the safety of our riders, workers and pedestrians first,” said Assembly Member Rebecca A. Seawright. "Vision Zero is a goal that all of New York City is striving for. I applaud the Department of Transportation's new steps and procedures meant to protect DOT workers and residents from injuries, fatalities at work sites, said Council Member Ben Kallos." These new safety requirements offer a future where recent construction site accidents would not occur, making New York City a safer smarter city." “Traffic crashes in New York claimed the lives of 5,775 people between 2010 and 2014. When driving near work zones we urge motorists to slow down to protect the men and women working to repair and rebuild New York’s aging infrastructure as we strive to achieve vision zero, said Denise Richardson, Executive Director of the General Contractors Association of New York. “Although we focus on work zone awareness this week, we cannot forget its importance the other 51 weeks of the year. Educating drivers about the risks they present to themselves, their passengers and in particular, workers in work zones, is a good administrative control but we need tougher laws when a work zone is violated and a worker gets hurt,” said Guille Mejia, Director, DC 37 Safety and Health Department. “Every day our hard working men and women go to work on our roadways,” said Michael Coppola, President, Local 1157, DOT Supervisory Employees. Educating motorists though events such as these is a major step in making sure they arrive home safely to their families. To keep these and other workers safe, DOT will now use new vertical panels in work zones as a channeling device when lane width must be restricted. Taller than pylons and with a smaller footprint than barrels, vertical panels prevent vehicle encroachment into a work zone’s lane of traffic, warning oncoming motorists, who can more easily distinguish between active and closed lanes. 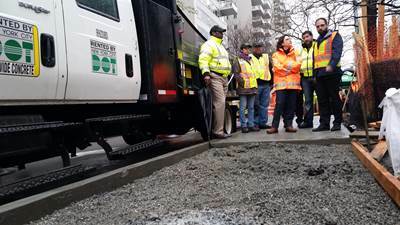 For the agency’s larger road crews, DOT will also be deploying additional Safety Supervisors to ensure work zones are being maintained to keep motorists, pedestrians, cyclists and workers safe. Additionally, DOT recently started to install truck side guards on appropriate vehicles as part of Mayor de Blasio’s Vision Zero initiative. Truck side guards are vehicle-based safety devices designed to protect pedestrians, bicyclists, and motorcyclists when there is a side-impact collision with a truck. In New York City, nearly two dozen DOT workers have been injured in work zone incidents since 2009 and six have died from work zone-related events during the past two decades. For information about work zone safety, Vision Zero and other efforts, visit nyc.gov/dot or nyc.gov/visionzero.